On November 13, HCIF and Capital BlueCross hosted the third annual half-day conference entitled, “Improving Patient Safety through the Leapfrog Survey and Regional Collaboration.” The conference gathered quality and safety leaders from hospitals across Central Pennsylvania to learn about innovative approaches to central line-associated blood stream infection (CLABSI) prevention and management of risks and hazards. These topics had been identified as opportunities for improvement and shared learning by analyzing Leapfrog Hospital Survey scorecard results. The conference highlighted how local hospitals are leveraging their Leapfrog Survey results to drive quality improvement. 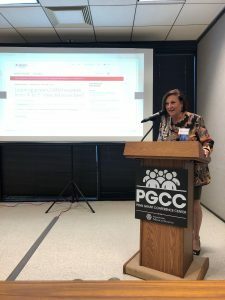 Featured speakers included Maureen Ann Frye, Director of the Center for Patient Safety and Healthcare Quality at Abington Jefferson Health and Dr. Valeria Fabre, Assistant Professor of Medicine, Division of Infectious Diseases at Johns Hopkins. Ms. Frye presented on how hospitals can identify and mitigate risks and hazards through a framework of awareness, accountability, ability, and action. By sharing tools and strategies employed at Abington Jefferson Health, Ms. Frye also focused on how to integrate the assessment of risks and hazards with a high reliability strategy. Dr. Fabre’s presentation described strategies implemented at Johns Hopkins intended to achieve their goal of zero CLABSI. Dr. Fabre also showcased Johns Hopkins’ innovative approach to reduce unnecessary blood cultures. Reaction panels comprising of representatives from local, high-performing hospitals who shared additional quality improvement strategies followed both presentations. HCIF and Capital BlueCross will next host a webinar in the spring to present analyses of 2018 Leapfrog Hospital Survey scorecard data.